Spring is such a magical time! Plants which lay dormant throughout the winter become alive again with fresh and vigorous energy, actively emerging up through the earth, pushing out fresh new shoots, proudly displaying vibrant tender tips, and bursting into colorful blossoms. Dandelion flowers are one of my favorite springtime herbals. 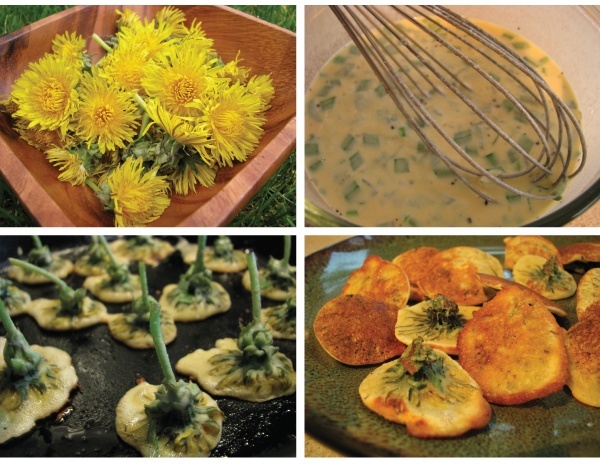 Not only are fritters a perfect way to use Dandelions before they burst into seed, but their mild and slightly bitter flavor is dangerously addictive! 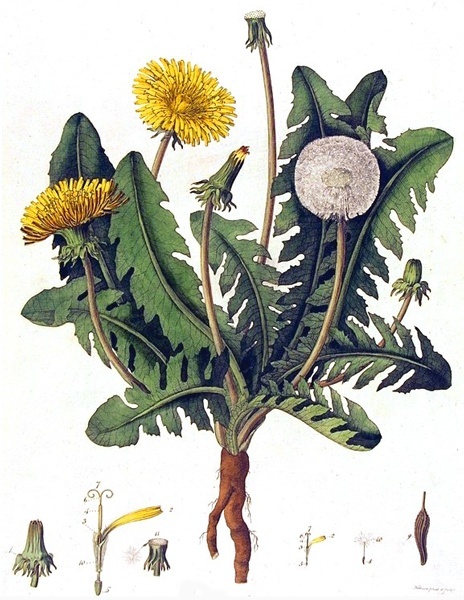 Gather Dandelion tops during the day, when the sunshine has opened up the bright and cheerful flowers. Rinse in cool water to remove any critters or debris, and allow to dry while preparing the batter. To make the batter, combine egg, milk, and flour in a bowl and mix until all lumps are gone. If you prefer sweeter fritters, add a little maple syrup, honey, Cinnamon, or a dash of Vanilla extract. To make more savory fritters, try adding Rosemary, Oregano, Basil, Chives, Sage, Thyme, Tarragon, ground Peppercorns, salt, or even a little parmesan cheese. Prepare a skillet on the stove with olive oil over medium heat. Take one of the flowers, hold it by the greens at the base, dip into the batter, and twirl until the flower is covered in batter. Drop it into the skillet, flower side down. Continue dipping and dropping until the skillet is full. A second method is to remove the “petals” (each yellow petal of the dandelion is actually an individual flower with a single petal and reproductive parts), sprinkle them directly into the batter, then cook just like pancakes. When the fritters are lightly browned, flip them over, and brown on the other side. When finished, remove from the pan and plate. For a sweet treat, drizzle with maple syrup, honey, jam, plum sauce, or powdered sugar. For a savory snack, dip into aioli or a sauce made with tahini, mustard, curry, hot chili peppers, or anything else you wish!